Town secured their first win of the New Year in front of 2,200 travelling fans. After a tricky opening half, Joe Lolley and substitute Mustapha Carayol netted to send the Terriers 7 points clear of the drop, following a successful Christmas period. The referee took centre stage in this FA cup encounter, denying Nahki Wells a clear penalty, and then awarding one to Town in the dying stages of the game – which Wells took to salvage a replay. This was after Jamie Paterson gave the Terriers the lead, before Matej Vydra and Hal Robson-Kanu scored for Reading. Town’s biggest win of the year came when eventually-relegated Charlton Athletic came to the John Smith’s Stadium. Goals from Mark Hudson, Nahki Wells, Jamie Paterson, Duane Holmes and Jason Davidson secured the three points for David Wagner’s side. Mark Hudson scored his second goal in as many matches to cancel out Ross McCormack’s 2nd minute goal, following a Jonathan Hogg error. Far from the prettiest match, but another point next to Town’s name nonetheless. Despite a positive display against a play-off side, Town went down to Brighton. Harry Bunn equalised for Town, separating Bobby Zamora and James Wilson’s goals. Town suffered a third successive defeat at the hands of Cardiff. Peter Whittingham struck twice for the visitors, as Wells and Bunn netted for Town. This game was possibly one of Town’s best performances of the 2015-16 season, and it ended in defeat. Despite numerous chances, Town only scored one goal, through Nahki Wells. The hosts turned the game on its head in the final 10 minutes to run out undeserved winners. Philip Billing scored his first senior goal for Huddersfield Town and it was one to remember. It was struck into the top corner from range, which settled the game in favour of Town, after a Matt Mills own goal in the first period. Town recorded back-to-back wins as a late Nahki Wells goal gave the Terriers all three points at home to Wolves. Philip Billing was on the end of a controversial refereeing decision, as Town were held 1-1 at MK Dons. Nahki Wells struck a late equaliser after Billing was sent off for a high foot. Despite a catalogue of chances, Town couldn’t take anything from the game, with Ben Pringle netting the only goal of the game for the visitors. A poor performance, and lacklustre defending meant that Town’s poor record at Derby continued, with Chris Martin and Johnny Russell scoring for the hosts. Town got their revenge on Reading for the FA Cup defeat with a comfortable 3-1 win in the league. Wells, Paterson and Bojaj all scored for the Terriers. The gulf between the top six sides and Town was becoming very apparent, and was emphasised even more when Burnley made the trip across the Pennines. Joe Lolley was on target for Town. Town’s first win over Leeds at Elland Road since 2013 was worth waiting for, as despite missing a penalty, Wagner’s side embarrassed Leeds. Hudson cancelled out Leeds’ opener, before a second half riot saw Bunn, Matmour and Wells all score. In a game of very few clear cut chances, Town defended solidly. Forestieri slid in at the back post to net the winner for Wednesday, but Town were left hard done to by the officials, as a clear handball on the line wasn’t given. Middlesbrough’s quality shone through at the riverside, as Gaston Ramirez scored twice for ‘Boro as they continued their eventually-successful promotion bid. Rajiv Van La Parra announced himself to Town fans with a fantastic performance against Hull. Paterson scored for Town, who thought they’d nicked a late winner through an own goal, just to be denied by a stoppage time Hull equaliser. An image that we have become so used to made its first appearance at Ewood Park, as Wells scored for Town along with an own goal. This proved to be the final win of the 2015/16 season. Town held a revitalised Rotherham under Neil Warnock to a point, after Nahki Wells cancelled out Halford’s opener for the Millers. Despite dominating the game, Town found themselves behind to a Birmingham free-kick, however Joel Lynch poked home from close range to salvage a point for the Terriers. Town’s last away game of the 2015/16 season proved to be their heaviest defeat. A double from Kodjia, and goals from Bryan and Tomlin meant that Town slipped to 19th in the table. Town stumbled to the end of the 2015/16 campaign with a second successive 4-goal defeat. Paterson scored on his final game for the club, however it was nothing more than a consolation. This meant that Town finished the season in 19th place on 51 points, 11 points clear of the relegation zone. Wagner’s new-look team started the new season with a win, as they got revenge on Brentford. Elias Kachunga opened the scoring, whilst Kasey Palmer came off the bench to net the winner. Town suffered defeat in the first round of the league cup, as despite an equaliser from Kachunga, the hosts scored in the second half to defeat the Terriers. Arguably Town’s best win of 2016 came at relegated Newcastle United. Nahki Wells opened the scoring, before Jack Payne came off the bench to win it for Town. 3200 away fans made the trip to St James’ Park. Just 3 days after winning in Newcastle, Town made the trip to another relegated side – Aston Villa. The home side dominated the first half, and opened the scoring. However, after the break the Terriers had Villa on the back foot, and after numerous chances, substitute Hefele charged down the goalkeepers kick to send 3000 travelling fans into dreamland. Town’s fine early season form continued at home to Barnsley, to secure their 7th point in a week. Chris Lowe’s stunning first goal for Town was cancelled out by the impressive Tykes, however in injury time, Hogg fired into the top corner to ensure the three points were Town’s. Rajiv Van La Parra finally netted his first goal for Town in a win over his former team. The goal, combined with a first clean sheet of the season meant that Town stayed top of the Championship. Town made it two wins at Elland Road in 2016 with another fantastic away performance. An away following of over 2700 saw Aaron Mooy fire home his first Town goal, as Wagner’s men extended their lead at the top of the league. The Terriers endured their first league defeat of the campaign at Brighton. Anthony Knockaert’s shot squirmed past Danny Ward in the Town net – the only goal of the game. Town’s 100% home record continued as they got back to winning ways against QPR. Kasey Palmer opened the scoring, before Elias Kachunga made it 2-0. The visitors scored a late conciliation. A second league defeat came at Reading, where despite a strong performance, Town went down 1-0. Rajiv Van La Parra was sent off for dissent in the 26th minute, however the Terriers could’ve snatched a point. Wagner was forced into making changes due to suspensions, and the depth of the Town squad was shown in this win. Kachunga scored within 2 minutes, whilst Nahki Wells netted the winner. Christopher Schindler’s first ever goal for Town meant that Town secured a victory at Portman Road, and further extend their lead at the top of the Championship. A penalty decided a very even game live on Sky Sports. Rajiv Van La Parra handled the ball in the area and Wednesday’s Forestieri converted from the spot. Town’s difficulties from set-pieces were on show at Preston, as they conceded from three to lose their second game in four days. Nahki Wells scored a late conciliation for the Terriers. 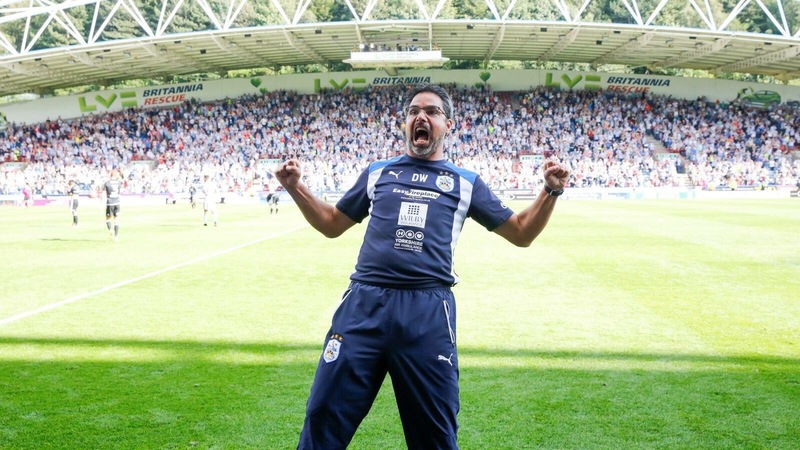 David Wagner was sent to the stands for his excessive celebrations as Town beat Derby County to return to winning ways. Kachunga’s injury time winner was enough to knick all three points for the Terriers, to make it 6 mins from 7 home games. Town’s worst performance of 2016 came at Fulham. 3-0 at half-time, the fans were the only positive, as over 2700 of them sang for 90 minutes despite the result. A much-improved display against Birmingham only resulted in a point, as Kachunga’s opener was cancelled out by ex-Town man Lukas Jutkiewicz. Town’s poor form continued as they lost at struggling Cardiff. Ex-Town man Morrison was on the scoresheet, whilst Tommy Smith scored his first league goal for the club. Philip Billing re-introduced himself in style, scoring one of Town’s best goals of 2016 off the bench. Town were left bemoaning a poor refereeing performance, as despite dominating the game, they went down to Wigan. Two clear penalties were turned down, whilst Aaron Mooy scored his second Town goal. Kasey Palmer opened the scoring in one of Town’s best performances of 2016. Wagner’s men hit the woodwork multiple times, and were made to pay for missed chances as Hefele gave away a penalty. Graham converted to level for Blackburn. Nahki Wells scored the winner as Town ended their poor run, getting back to winning ways. Kachunga headed in the opener, before the visitors scored from a set-peice. Wells then pounced on a goalkeeping error in the second half to secure a big three points for Wagner’s men. Nahki Wells scored his second winner in four days as Town won back-to-back games for the first time since October. After a difficult game, Wells netted five minutes from time to ensure all three points came back to Huddersfield. Town finally ended their poor run in front of the Sky cameras, as they defeated a second relegated side in Norwich City. Elias Kachunga scored a first half double in one of Town’s best victories of 2016. David Wagner secured his second boxing day victory, as Town came from behind to beat Nottingham Forest. Palmer scored before an own goal completed the turnaround. Forest had Mancienne sent off in the late stages for dissent. Town ended 2016 with another frustrating 1-1 with Blackburn. After dominating the game, Town conceded, before Wells netted a 90+4 equaliser. Previous Wagner hails ‘brilliant and fantastic’ Town performance! Next Rollercoaster season extended – Town confirm Play-offs!